Swami Karunyananda is perhaps the only person who came to Swami as a 60 year old and still managed to stay with Him and serve Him for four decades! A common sight for the regular Puttaparthi visitor in the 1970s, 1980s and 1990s, Swami Karunyananda happily gave up an entire service organisation he had started from scratch in order to find ultimate fulfilment of his life. 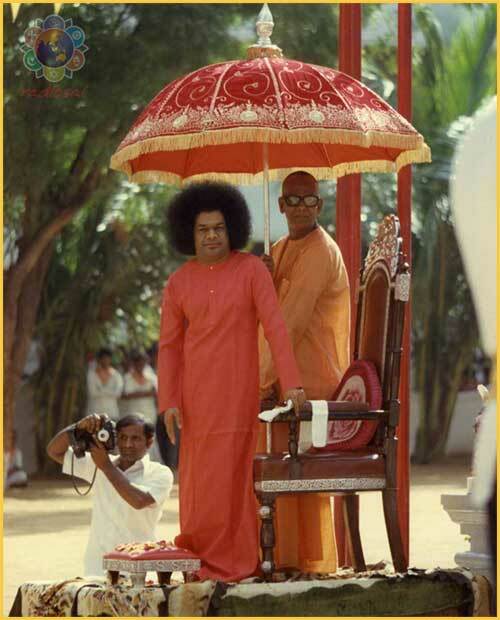 From walking behind Bhagawan holding an umbrella to holding the empty pot from which Baba manifested vibhuti galore; from staying with Swami to travelling with Him to distant places - Karunyananda was blessed with it all. His is a story extraordinaire of a man’s passion for service and God’s appreciation of it. The rain clouds bore broad smiles as they showered profusely on the freshly planted paddy, mango, cashew and sugarcane crops in the fertile district of East Godavari in Andhra Pradesh. The Godavari river was in spate and she resembled an excited girl dancing and prancing in the presence of her beloved. Nature had donned her fresh green vesture dotted with myriad colours. 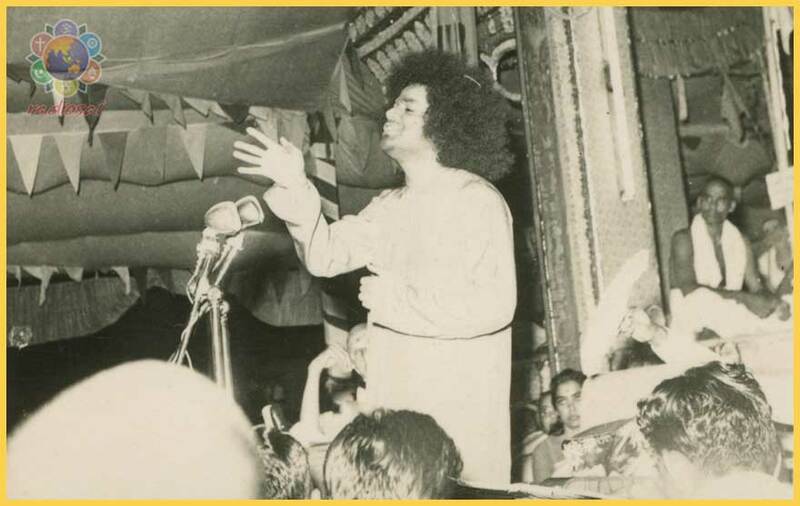 The first day of September 1958 was definitely one of great joy and divine romance in the region because Bhagawan Sri Sathya Sai Baba was crossing the river and stepping into East Godavari! Baba was travelling from Puttaparthi to the city of Rajahmundry, often considered as the cultural capital of Andhra Pradesh. The citizens of the city gathered in thousands in the Municipality Museum Hall where Baba was scheduled to address everyone. In the crowd was also a 64-year old gentleman who was highly revered in Rajahmundry for his philanthropy and social service. He had come along with his mentor and Guruji, Sri Malayala Swami. It would be only the second time that he was seeing Swami in his hometown. There were bhajans for an hour before Baba rose to speak. Baba’s discourse in the hall that day was as simple as it was profound. It simultaneously moved and inspired the gentleman just as it did the crowd which had gathered. Baba simply called upon everyone to cultivate uprightness and equanimity and take repose in Namasmarana (the remembrance of the Divine Name). The meeting concluded and everyone was leaving. The gentleman rose with his Guru and moved towards the exit when, suddenly, he heard his name being called. Swami Karunyananda turned around and saw that it was Baba! He instinctively saluted Him though he was 32 years younger. Sri Malayala Swami looked on in joy. He knew that his task was now completed. His disciple had reached his destination. “What is the matter Swami? How can I help You?” asked Swami Karunyananda. Thus it was that before setting out for multiple towns in East Godavari, Bhagawan Baba visited the Gowthami Jeeva Karunya Sangam and blessed the workers and inmates there. Swami Karunyananda was touched. The Sangam (literally translates into ‘association’ though it also refers to ‘society’) had been his life. He was attached to it because he had selflessly and painstakingly built and nurtured it. But to see another person exhibit the same passion and enthusiasm for it was a moving experience for the sexagenarian. “Karunyananda, you are clapping in union seated before me now. A time will come when you can see me only from a distance." The way crowds thronged around Swami, Karunyananda was sure that such a time would surely arrive in the future. Early next morning, Swami set out on the East Godavari tour starting with Mirthipadu, a village about 15 kilometres away from Rajahmundry. Swami Karunyananda was also with Him in the car. The journey over the next few days would be a turning point in Swami Karunyananda’s life. At Mirthipadu, Swami made an instant connect with the ryots that had assembled. His message to them was simple and heart-to-heart. 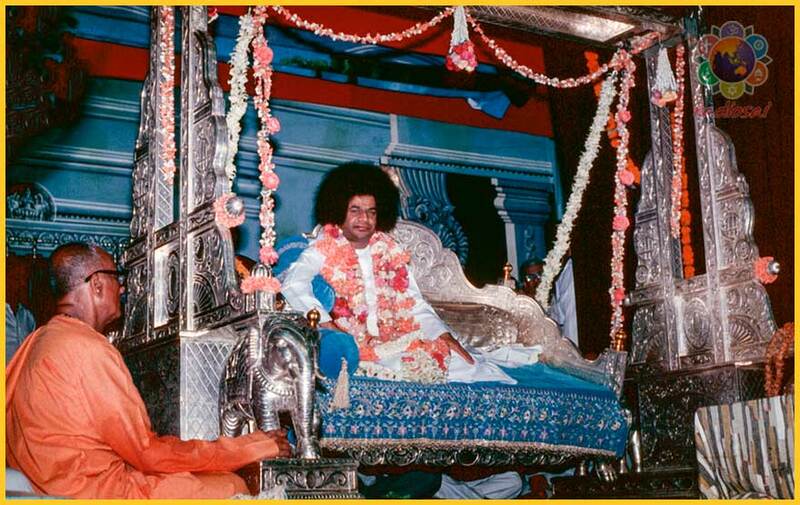 Karunyananda realized that this Sathya Sai was not a preacher; He was a teacher nay a divine Guru. 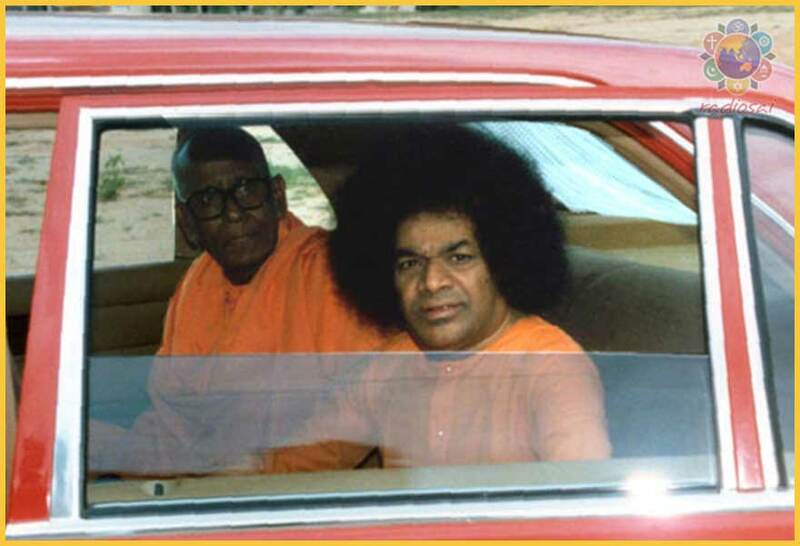 As the car sped on, Swami began to peel away at Karunyananda’s awe with a friendly informal chat. Closing his eyes, Karunyananda began singing for Swami. 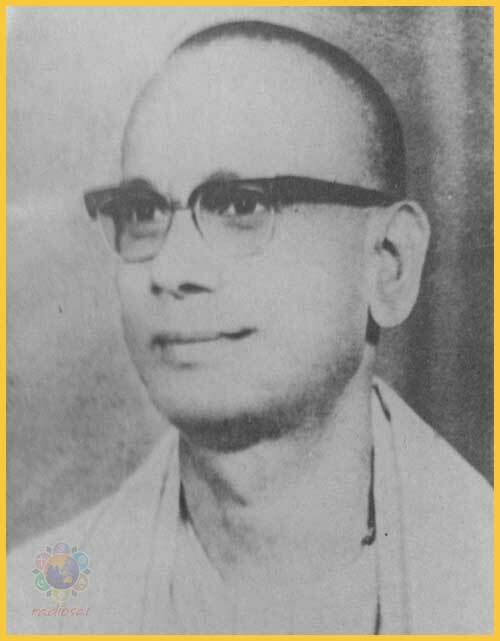 As the song progressed, he experienced the joy that Ramadas experienced while singing for his Rama. In that moment of bliss, Karunyananda had a flashback which gave him goosebumps. He remembered the first darshan he had of this Swami. ‘Coincidentally’ that had been at Bhadrachalam - in 1936! The devotees at Bhadrachalam firmly believe that Lord Rama will visit them in Kali Yuga as promised to the devoted son of their soil, Ramadas. Little Sathyam’s visit in 1936 and the other visits He made to Bhadrachalam later on were the fulfilment of this promise! As the car sped on, Swami built on the awe that Karunyananda was now feeling. He began to reveal the difficulties and hardships that Karunyananda had faced in his early life. As Swami empathised with and appreciated him, Karunyananda was simply spellbound. How could Swami know of events that were only privy to him? How could He know of episodes that had transpired nearly three decades before His birth in 1926? Truth to be told, Venkatasubbiah (Swami Karunyananda’s childhood name) had been a very special child. Even as he just learned to speak, he expressed his karuna (compassion). The three year old child, while suckling at his mother’s breast one day, noticed that another baby was in distress. Venkatasubbiah’s mother smiled as she picked the other baby and put it to her bosom. She was so proud of her son’s large heartedness! The mother too played her part in inculcating divine values in her son. A few years later, in school, one boy abused and hit little Venkatasubbiah. It was the same boy for whom Venkatasubbiah’s heart had melted and had made him sacrifice his share of mother’s milk! Venkatasubbiah insisted that the boy must be punished. This was the 1890s and this was India. Almost every parent used the stick of discipline on the child - in the literal sense too! The rod was not spared; the children were not spoilt! And (thankfully) there was no court of justice where the child could sue the parent. As the mother walked with Venkatasubbiah towards the other boy’s home, she saw a rabid dog by the roadside. Venkatasubbiah stopped in his tracks. He was intelligent enough to understand what his mother was teaching him. It was as if the good karma of several lifetimes and the pious environment in which he was brought up was culminating in Karunyananda’s good fortune of accompanying the Lord as His travel companion. The drive and the week-long tour were unforgettable for him. It was the 3rd of September and Swami visited the villages of Thoredu, Biccavole, Kattamuru and Samarlakota, before reaching Peddavaram, where He gave a discourse to a huge gathering of people. His message, here, was on strength - physical, mental and spiritual. It was indeed a miracle that in spite of the incessant rain and floods, Baba held back the inclement weather at all places where He stayed and spoke! His stay contributed in no small measure to allay the panic caused by the floods. Prema Godavari (the river of love) made the people forget the Purna Godavari (the river in spate)! Karunyananda was no exception. The whole trip had changed him into a devout follower of Baba. The eagerness to meet Bhagawan Baba again was very strongly rooted in Karunyananda's heart and he awaited the opportunity. The next year, Karunyananda decided to visit Swami at Puttaparthi during Shivaratri along with several others from the Jeeva Karunya Sangam. The entourage set off from Rajahmundry in two jeeps, a van and a car. They travelled about 650 kilometres to Chittoor where the Sangha had an office. From there, Karunyananda decided to travel the distance to Puttaparthi by bus. “These so called Babas - why do they put us to this trouble? Why do they reside in the hills? Why can't they set up residence in a place accessible to common people? How many people are suffering because of that!" The driver managed to repair the bus and transport the passengers to Mudigubba by 2 am. Karunyananda waited there till dawn to catch another rickety bus to Bukkapatnam. As if that was not punishment enough for his 65 year old frame, he had to endure a bone-shaking bullock cart voyage to Puttaparthi. “What Karunyananda! What is the news? How many cars do you have?" “Swami, why should You talk about cars now?" But Bhagawan insisted, "No, no. How many cars do you have?" The scholar, Veerabhadra Sastry, who had also arrived for Shivaratri asked Karunyananda, "When Swami asks you, why do you not reply?" “Ah well! Swami, I have two jeeps, one car, and one van." "When you have four vehicles, why could you not come by one of them? Why come by that bus, and blame Me thinking - ‘Why do all these Babas reside only in the Hills?’"
Karunyananda decided that he would frequent Puttaparthi as much as possible. That apart, whenever Swami visited Rajahmundry, Karunyananda would be with Him throughout. He was blissful in the divine company and Swami too seemed to be happy to have him around. Karunyananda occupied a special place in Swami’s heart. Irrespective of where he was, Swami seemed to accompany him and be with him. On one occasion, Karunyananda had been to Chittoor on some Sangam work. The heat on his aged body made him swoon in exhaustion. He was rushed to the Government General Hospital where he was treated by Dr. Ramakrishna Rao who was himself Swami’s devotee. Knowing the affection Swami had for Karunyananda, he called up Prasanthi Nilayam and informed Swami of the happenings. Swami asked for Karunyananda to be brought to Puttaparthi immediately. Though the doctor felt that he was not in a condition to travel, he decided to obey Swami implicitly. A car was thus arranged to transport a semi-conscious Karunyananda to Puttaparthi. Even as the car reached Prasanthi Nilayam, Karunyananda seemed to feel his strength returning. He went straight into Swami’s room and fell at His feet. Swami led him to one of the ground floor rooms of East Prasanthi where doctors from the Sri Sathya Sai General Hospital monitored his health. Karunyananda was in tears. No words emanated from his lips. It was an emotional moment for him as he remembered his mother, Subbulakshmamma, who had passed away when he was just seven years of age. The statement from Swami was so full of love that he felt his mother’s love envelop him a thousandfold. The term 'Athithi Devo Bhava' (Treat the guest as God) was not new for Karunyananda but this experience of 'Athithi Devasya Bhava' (Becoming a guest for God) was his first. He wondered what was it that he had done to deserve such divine love. He had no idea that so much more would be showered on him - culminating in his staying with Baba at His residence itself! Karunyananda’s good fortune was not a stroke of luck. It was something that he had yearned for and also earned by his lifetime activities. Of course his good karma and upbringing too had a role but that is destiny which is beyond one’s control. What was it that Karunyananda did that got him so close to Swami? The answer lies in understanding and utilising the relationship that exists between four words that Swami often uses in discourses - Vyashti, Samashti, Srishti and Parameshti.